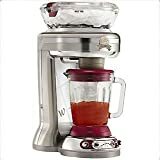 What could be smarter or more stylish as an accessory in a modern kitchen than a shiny red smoothie maker? 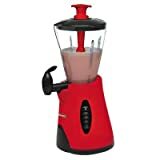 This piece of indispensable kitchen equipment is obviously becoming something of an icon judging by the rapidly rising number of google searches for smoothie maker red! So get ahead of the trend and own one today! These are a great way of using up left over smoothie mixture and make a delicious treat for children and adults alike in the hot weather. 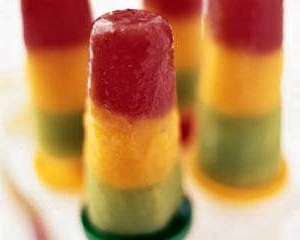 For a children’s party or special occasion, traffic light smoothie ice lollies are great fun and easy to make too! Whizz up the fruit in the smoothie maker. If the fruit is not sweet enough, add a couple of teaspoons of honey. Spoon the mixture into your lolly moulds to a depth of about one third and freeze for about an hour and a half. 250 grams of peeled and stoned peaches, or use nectarines or apricots or any combination of these fruits..
250 grams of kiwi fruit, peeled, or you could try dessert gooseberries which are delicious, but not so green! Once your amber layer has frozen, repeat the process with the green layer and push the lolly sticks into the full mould. The lollies will take about another hour and a half to freeze completely if the children can wait that long! 1. If you do not have a smoothie maker, you can puree the fruits in a blender and push the fruit pulp through a sieve if wished to remove seeds. 2. If you do not have any ice lolly moulds, you could use plastic egg cups or yoghourt pots and use wooden or plastic lolly sticks. Use your smoothie maker to make a smoothie and you are getting the whole fruit, with all its goodness, including the fibre-rich pulp so essential for the health of our digestive tract. Drinking fruit juice, as we all know is good for our health because of all the vitamins, antioxidants and trace minerals contained in it. Juice though is just juice, just a part of the fruit that you get by putting it through a press or a juicer. Did you know that a single three-fruit smoothie will usually contain about one third of your recommended 18 g per day of fibre. 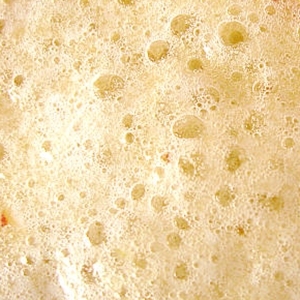 There are two sorts of fibre, soluble and insoluble. The table below showing some of the fruits most usually included in Smoothies, shows that they are a good source of both. Soluble fibre lowers cholesterol levels and helps to control blood sugar. It contains gums and pectin. Insoluble fibre helps you to have regular bowel movements by making stools soft and more bulky. 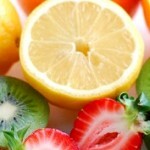 It helps to prevent constipation and long term health problems such as bowel cancer. 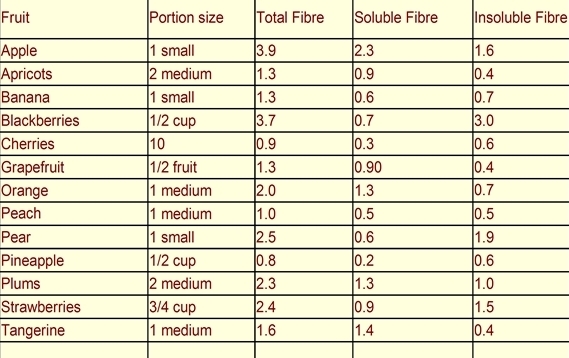 Insoluble fibre contains lignin, hemicellulose and cellulose. Top five benefits of drinking smoothies. 1. A healthy smoothie is a good way to get your children to eat the delicious fruits and vegetables that they might otherwise refuse at mealtimes. 2. 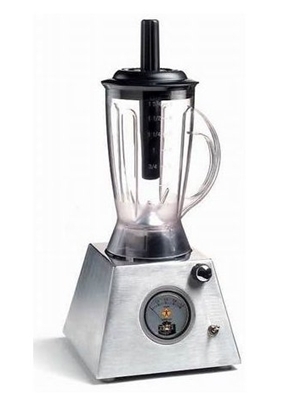 With a smoothie maker, a smoothie is a quick to prepare and very efficient way of topping up our recommended five portions of fruit and vegetables each day. 3. Use your smoothie maker to get a fruit energy boost, without having to get a ‘hit’ of caffeine from coffee. 4. By carefully selecting the ingredients of your smoothies, you can use smoothies for a natural body detox and give yourself a health spa treat in a glass. 5. Because they are quick and easy to prepare in the morning, they can be taken to work in a vacuum flask to keep cool and drunk throughout the day. 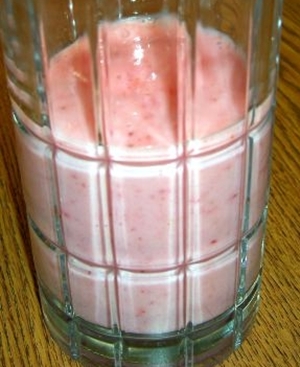 Buy a smoothie maker, make your own, home-made smoothies and save money. A home-made smoothie will cost you about half the price of a store-bought one and is much, much cheaper than buying one in a café or restaurant. 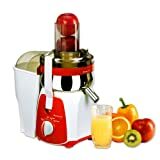 An added bonus to making your own smoothies at home in your smoothie maker is that shop-bought ones are often heat-treated (pasteurised) so that they stay fresh longer, you will only be drinking the freshest and most nutritious smoothies if you make them at home.